Rice-fish systems allow for the production of fish and other aquatic animals as well as rice from the same rice field area, and generally without causing reductions in rice yields. Coastal regions of Kendrapara and Jagatsinghpur districts of Odisha have been hit by cyclonic storms for more than two decades. These have severely affected the livelihood of the communities living in the region. Ashok Das of Junapangara village is one such farmer who had suffered massive agricultural losses. He owned around two acres of land, including homestead land, with a pond. With a wife, two daughters and a son to support, he gave up agriculture in 2011 and took up the job of a labourer. However, he was always keen to return to his farming roots. In 2012, he attended a Gram Paribartan Committee (GPC) meeting organised by the Regional Centre for Development Cooperation (RCDC) at his village. The RCDC had, in February 2011, implemented the “Paribartan” programme, a multi-country initiative on increasing resilience and reducing risks of coastal communities to climate change and natural hazards in the Bay of Bengal. The plan involved both climate change adaptation and disaster risk reduction aspects and hoped to make communities resilient to disasters as well as reduce poverty by introducing climate change flexible livelihood options. RCDC implements the Paribartan project in 84 villages of 8 Gram panchayats of two blocks of two coastal districts of Kendrapara and Jagatsinghpur. It was at this meeting that he got to know about the Integrated Rice-Fish Culture (IRFC) system of agriculture. What is Integrated Rice-Fish Culture? A rice-fish culture system is an integrated rice field or rice field/pond complex where fish are grown concurrently or alternately with rice. Rice-fish systems allow for the production of fish and other aquatic animals as well as rice from the same rice field area, and generally without causing reductions in rice yields. This source of animal protein also aids household nutrition as well as augments farm income. The components of IFRC are pisciculture, paddy cultivation, vegetable cultivation, horticultural trees, fuelwood trees and duckery. Any farmer who owns at least 1 acre of land and preferably has a pond in her/his field is eligible for the IRFC project under the Paribartan programme. RCDC will provide the technical and financial support to the interested farmer. With technical and financial assistance from RCDC and Central Rice Research Institute (CRRI) through the Gram Paribartan Committee (GPC), Ashok's life has changed. The financial aid paid to Ashok by RCDC was in the part of earthwork, fingerlings, fish feed, fencing material, vermicompost, fruit bearing plants, etc. 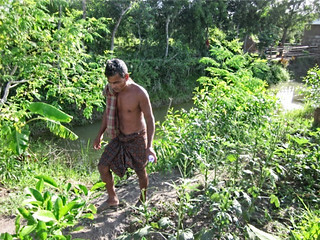 Besides paddy and fish, Ashok also grows a broad range of fruits, vegetables and fuelwood trees. Cashew, guava, orange, cucumber, papaya, coconut, mango, banana, drumstick, jackfruit, mushroom, pumpkin, bamboo, acacia, and karanja are some examples. In 2012, Ashok earned an income of around Rs 1 lakh from his IRFC unit that included the production of fish, paddy, fruits, vegetables, and the sale of organic fertilisers and firewood. The fish component alone provided him Rs.35,000. “Currently, the entire fish needs of the block are met by imports from Andhra. However, if the farmers of the region take up IRFC seriously, the day is not far off when a variety of local fish will flood the market rendering imports irrelevant", says Ashok. In 2013, despite being hit by Cyclone Phailin, Ashok still earned a sizeable income from his unit. The story would've been quite different if he had only depended on paddy. Rice-fish farming has many other advantages including the control of weeds, insects and pests resulting in increased rice yield. 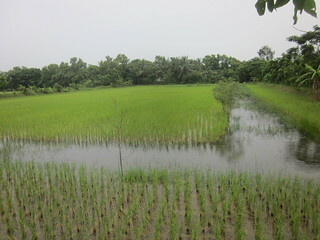 In the event of a sudden druught, the rainwater harvested in the refuge pond can be used to irrigate the rice and other crops. The potential for rice-fish farming in the country is high, and there is a need to provide institutional, technical and financial support to poorer farmers to promote the sustainable development of rice-fish farming. Applying the IRFC approach in other parts of the country could prove beneficial to all farmers.